A backyard breeder neglected the remaining puppies of a Weimaraner litter so North Mecklenburg Animal Rescue in Charlotte, NC took them in. Their ribs were showing and their skin was peeling from dehydration. 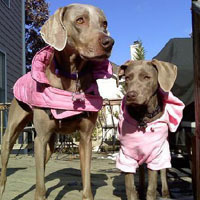 Read the adoption story of Daisy (on the right), pictured with Scarlett, in Stephanie’s own words. Stephanie Anderson of Whitsett, NC, and her husband, Doug, were looking for a “sister” for their six-year-old Weimaraner, Scarlett, and when they saw Daisy on Petfinder, they headed off to meet her. The shelter was at a temporary site while the staff waited to move to another location, and it had rained recently. The ground was muddy, and the pups had become dirty while they played. She and Doug couldn’t resist the lively five-month-old pups and got right down on the ground to play with them in the mud. They adopted a pup named Sugar, now called Daisy, but as a newcomer to life in a home, she had some challenges to overcome. Loud noises scared her, and she ran upstairs whenever the doorbell rang. Fortunately big “sister” Scarlett helped her transition. The two took to each other right away. Scarlett recently passed away from cancer, and Daisy was bereft. She hid under the bed for two days after Scarlett’s death. The Andersons decided that another dog might help Daisy deal with her grief. “When you lose one, you’ve got to make room to love another,” Stephanie says. Their newest addition, a retired racing Greyhound, did help Daisy deal with her grief. She has become her old self again, Stephanie reports. The Andersons also have a cat. These three four-legged family members were all Petfinder “finds” and have become finders’ keepers.